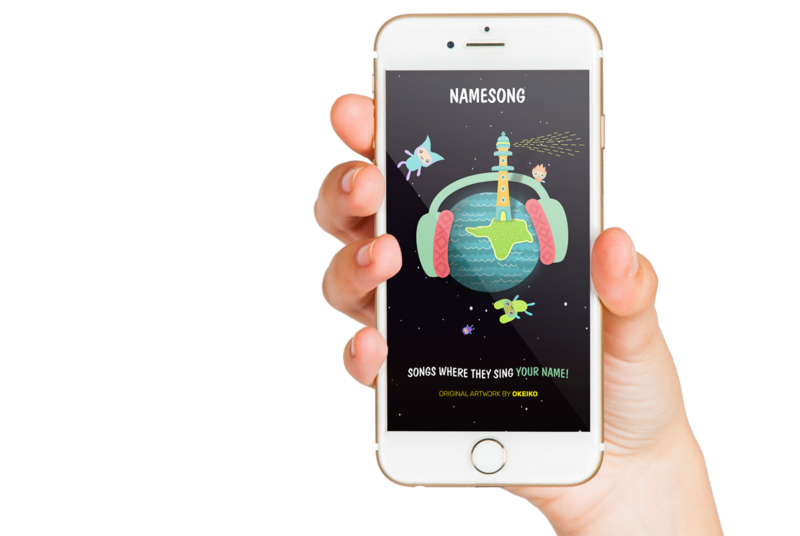 Namefactory – We create songss where the child is a hero! We create songss where the child is a hero! It’s the magical place where NAMESONGS are created for children around the world. We create songs where every child can hear their own name, songs where every child is a hero. Namefactory was founded in 2010 by four individuals from three countries linked by existing, but un-related business connections and as parents to young children. at Namefactory is to create fun educational songs and animations for young children aged one to eight years that add more quality to existing traditional songs and lullabys. Our aim is to have different kind of personalised content available to all kinds of existing and future devices and we hope it will remain loved by kids in many languages and in every coming generation. What makes our songs special? Every song we create is personalised. Every child gets to listen to all our songs with his/her name in it. It gives the child all the attention when listening to our different themed songs. Music affects the growth of a child’s brain academically, emotionally, physically and spiritually. It ’s the universal language every person understands. Animated stories nourish child’s imagination and fosters their emotional construct. A person receives 90% of information through their eyes. A name makes every person unique in a way. Kids love to hear their name. Attention is very important for children – they always need some encouragement and support. ..and this is how the NAMESONG is born. NAMESONG is a collection of cheerful and educating children songs with your kid’s name in it. Every NAMESONG is dedicated especially to your kid and every music piece takes your kid to different exciting adventure! For example your kid can wake up with NAMESONG “Morning song”, learn how to eat healthy with “Good food song”, learn alphabet with “Alphabet song” and travel around the world, discover new places with “Travel song” and much more. Altogether 8 different songs. All NAMESONG songs are written and performed by well-known and established estonian songwriters and singers from England, Brazil, Germany etc. All our songs are well produced and the inclusion of any child’s name to individualise them sounds natural. The songs and names are all sung in each language by the same singer making the insertion of any name seamless. At the moment we have songs in 4 languages – Estonian, Russian, Danish and Swedish. We are currently working on songs in German which is scheduled to go live in the last quarter of 2018. Namefactory will extend our portfolio to English, Spanish, Portuguese, German, French in the near future. Following on with languages of Asia and the Far East. You can view 8 cute animations with personalised songs with your name in it! Surprise your Friends and send them NAMESONG with their name!